ScuffSleeveä Abrasion resistance sleeve for hoses and cables that are moved regularly or flex in operation can be provided by using ScuffSleeveä, available as a sewn sleeve or a sleeve with Velcro for easy retrofit, inspection or replacement. HD Nylon, the same 1050 denier nylon with a 1.5oz urethane coating. Temperature range is -60°F to +180°F. Very good UV protection. -60°F to +180°F. Very good UV protection. PVC/Nylon is a heavy PVC coating over a 1000 denier base fabric. 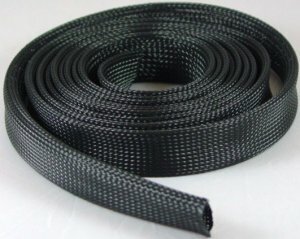 Tough protection for cables and hoses used on the ground, for construction equipment, drill rigs, etc. Temperature range is -20°F to +150°F. Very good UV protection. These sleeves are sold in 25 foot increments, up to 150 feet continuous rolls.